The following vidcaps correspond to the extraordinary recording achieved by young Sergio Javier Mayen, who manage to see two unidentified flying objects over Mexico City’s Torre Blanca district on October 21, 2005 at 18:26 hours. Given the importance of the images, I visited the eyewitness’s home to interview him and conduct research at the place where the sighting took place. ALC: Hi Sergio. How old are you? Sergio: I’m 16 and study at a vo-tech. I want to be an architectural engineer. ALC: Could you please tell me about your experience on October 21? Sergio: Well, that afternoon I climbed onto the roof to fetch my sister Melissa, who was playing there. It was she who told me that there was a UFO in the sky. We both saw a red-colored sphere and I quickly went down to my bedroom for the camcorder. ALC: Did you manage to record the red sphere? Sergio: It wasn’t possible. When I went back to the roof, the red sphere had gone. Then I looked to the right to find it and made visual contact with anothre UFO – a spherical shining object at low altitude, hanging in the sky. Since the camera was ready, I did manage to record it. Sergio: After recording the sphere and taking some photos of it, I realized that an airliner was about to go by and I decided to widen the view so that this reference could appear. 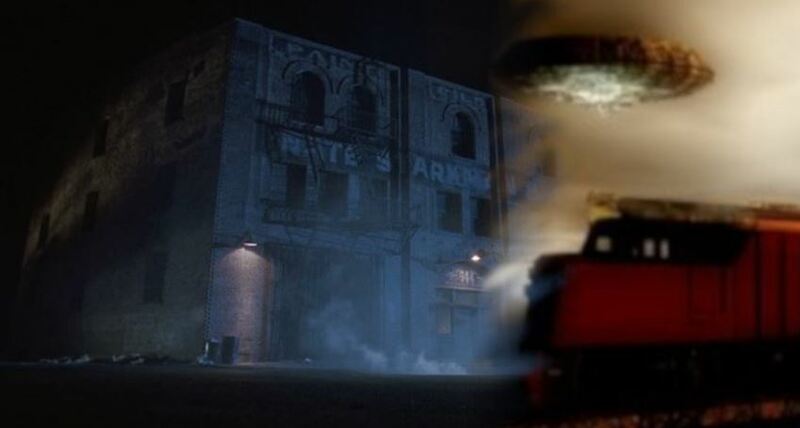 In the first moments of the video only a single UFO can be seen; another one in motion appeared later. ALC: How was that object moving? Sergio: It moved very quickly and on the rise, toward the zenith. For that reason I was certain that it couldn’t be an airplane or anything known. ALC: Could you describe it? Sergio: Of course. We could clearly see that it was a spherical black object that had other smaller spheres around it, that were very luminous. ALC: How long did the sighting last? Sergio: I think about 3 1/2 minutes approximately, since the UFO was rising into the firmament very quickly. It was much faster than an airplane. The first sphere, the static one, I lost from sight once I changed the camcorder’s battery pack. After a few moments there was nothing unusual in the sky. It’s also important to note that the original video shows that some things crossed the UFOs path. For example, small little white spheres and an elongated black object that goes by quickly and can only be seen when the recording is played in slow motion. ALC: Is this your first UFO sighting? Sergio: No, I’ve seen them on other occasions and even managed to record one with my cellphone, but I don’t have it anymore, since my little sister erased it. I remember that on that day I’d been talking to a friend about a sighting I’d had in Guanajuato and I raised my arm to indicate the UFO’s altitude at the time. Then we both turned around and we found a luminous sphere. NOTE: The above image is CGI. On the evening of 21st October 1977, “Howard Albert” a C&O railroad engineer was sat in the locomotive cab of the trainload of box cars on the Fostoria Distribution Company warehouse railroad. They were on their twice daily run to pick up processed food for distribution around the Fostoria and larger Columbus area. The warehouse track was around three miles outside of Fostoria, just to the east of the main rail lines and around 200 yards from Route 23. In Howard’s hand was the walkie-talkie that he would use to stay in contact with the conductor, Donald, (who would check the cars) and the breakman (who made would guide the cars into the warehouse itself). It was around 3:20 am. Suddenly, what looked like a “shooting star” would catch Howard’s attention. It was moving across the sky, coming out of the west. Then, it “curved downward” changing its direction more to the north. Realizing it wasn’t a shooting star, he continued to watch the falling light. It would come down to the ground in a field near Route 23 and close to a nearby church. Then, it began to come towards him, “slowly, at the speed of a walking man”. He would estimate the glowing object to be around sixteen feet from the ground. It continued towards him until it was just over 200 feet away from where it would stop. It remained hovering above the ground on the other side of the tracks. Howard, still not taking his eyes from the object, raised his radio to his mouth stating, “Donald! Come up to the engine”. Donald, while making his way to Howard’s location asked what the problem was. In response, Howard would state “we got a UFO up here”. The strange object began to approach again. This time it would stop just over 100 feet from Howard’s cab. He would later describe it as a disc or even a “birthday cake” shaped object. He would estimate it to be around 90 feet across and nearly 50 feet high. Glowing “banks of vertical tubes” around the object made it shine brightly. The underside had a ceramic feel and was a gray color similar to “a knife sharpening stone”. He couldn’t make out any windows or any other markings on the exterior. He also couldn’t hear any sound coming from the object at all. It had a slight tilt to it as it hovered and “rotated counter-clockwise”. Howard and Donald would each use their stopwatches to time the rotation speed of the object. Both would agree this was nine revolutions per minute. They would also notice blue “electric-like energy arcs” that would move around the exterior of the disc, lighting up the tubes as it touched them. Suddenly, the radio operator at the Fostoria control tower, hearing their conversation, would ask for confirmation that a UFO was over the railyard. Howard would confirm this. And then would decline an offer to inform the police. He would state to the control room operator that “they can’t drive up to where we’re at”. He would then add that even if they did “they’ll probably just shoot at it. It isn’t hurting anybody”. Besides, he continued, “we’re playing games with it”. As he said this, he flicked on the main train headlight, leaving it to glow for two full seconds. The glowing object would respond in a similar fashion, suddenly glowing brightly for two seconds, then dimming again. Although he didn’t wish to put the train in motion, Howard switched on the engine, intrigued to see if it still worked. Although the object would respond to the lights flashing, it didn’t respond at all to the sound of the engine, even when Howard intentionally increased the output somewhat before switching off the power again. Howard would also recall how a “knowing” was present in their minds. Aside from his switching on of the engine, he would state that both he and Donald were somehow aware they should not cross the tracks and attempt to get any closer to the object. Just as they were aware if they were to sound the whistle of the train, the object would suddenly leave. Perhaps, then, Howard was also right in his assessment of the police and keeping them away from the situation. Although he couldn’t explain why, Howard believed there were definite intelligent occupants inside the object. He believed they were interested in the engine of the train, which he claimed was a “relatively uncommon model”. This is an interesting theory. Perhaps suggesting that whoever or whatever is behind these mysterious crafts perhaps have as much interest in our propulsions and mechanics as we do in theirs. They would watch the object for just over twenty minutes before it began to increase the speed of its rotation. Getting increasingly faster the object then simply took off into the sky. Within seconds it looked like a “yellow-star” in the distance. By the time the conductor of the train arrived at the cab, who had heard Howard and Donald’s conversation throughout, the object was already heading off upwards and into the night sky. All he would see is a “star-like” craft heading away from them. NOTE: The above image is CGI.